You know the deadline dates, here Jackson Hewitt refines by communicating Tax Time Will Return at 11:00 AM. See also that at least the impression of security is tight with a chain lockup for the in-store Kiosk. Just don’t look too close or you will discover it is a plastic security chain. Still, better than a rope, one assumes. 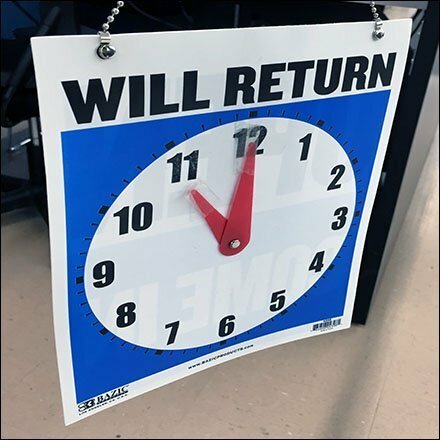 This Tax Time Will Return at 11:00 AM open and close communication device seen at the Jackson Hewitt Tax Service In-Store Kiosk at Walmart. “ Store Hours Store Fixtures Pinterest Board “ for a visual summary.